Experience the enveloping sound of DTS:X™ and Dolby Atmos® featuring the Reflex Optimizer for Atmos-enabled speakers, accompanied by the spectacular view of Ultra HD video, HDR10, and Dolby Vision. FlareConnect™, Chromecast built-in*, and DTS Play-Fi®* let you stream music anywhere across the house. Listen to a multitude of songs via internet radio and network streaming services, controlled by the Pioneer Remote App. With Powered Zone 2, and a phono and 6 HDMI inputs (plus a front HDMI), a wide range of options are offered on the Elite® VSX-LX302. The VSX-LX302 is compatible with 5.2.2ch configuration of the latest theater sound platform, Dolby Atmos®. You can reproduce object-oriented sound in smooth, curving movements, or the realistic three-dimensional movement overhead by the top speakers. The VSX-LX302 supports pass-through for HDR10 and Dolby Vision. By connecting the source device, you can enjoy these latest video standards on a compatible display. What’s more, all HDMI terminals support 4K, BT.2020, and HDCP 2.2, so you will have no problem when upgrading to new devices. The VSX-LX302 features Chromecast built-in, so you can use your mobile device to stream your favorite music, radio, or podcasts to your speaker. You can control the audio from anywhere in the house using Chromecast-enabled apps running on your personal device—iPhone, iPad, Android phone and tablet, Mac and Windows laptop, and Chromebook. Discover Chromecast-enabled apps at g.co/cast/ audioapps. 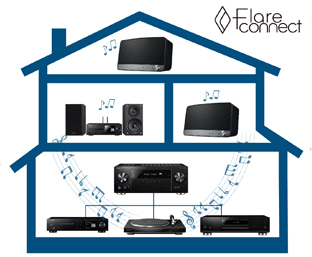 DTS Play-Fi* wirelessly streams any audio content from any compatible mobile device to the VSX-LX302 and DTS Play-Fi compatible audio systems, creating a multi-room system in your home. You can stream different sources to different speakers at the same time from the DTS Play-Fi app.